Video footage recorded on a police officer’s body camera should stay private to protect the confidentiality of innocent people caught on film, according to a proposal in the Minnesota state House. Some say the argument blocks police accountability. Throughout the United States, local and state governments are grappling with how to handle an increasing desire for law enforcement to employ body cameras which, advocates say, are an important check on police power. Body cameras have become the focal point within law enforcement reform efforts, especially after the fatal police shooting of an unarmed teenager in Ferguson, Mo., last August. While many support the cameras as a tool for increased police accountability, others say they're just another form of surveillance which has not led to more convictions of rogue cops. 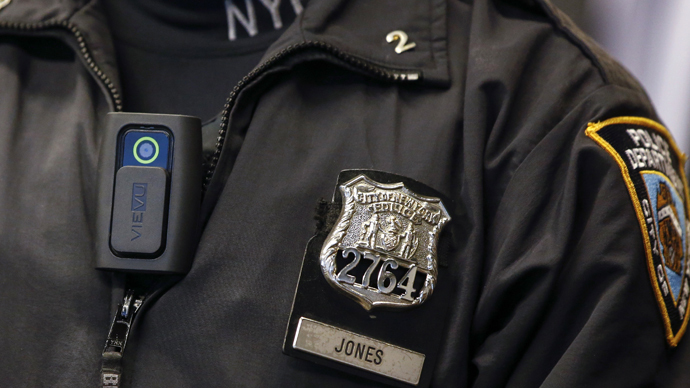 In Minnesota, state law deems that body camera video material should be open to the public. Rep. Tony Cornish’s legislation, however, is focused on how to keep footage under wraps to respect the privacy of victims or those inadvertently caught on camera. "You could have a half naked housewife that's been beat up with a bloody face, half naked kids running around," Cornish said, according to Minnesota Public Radio. "You could have a gun collection. That information needs to remain private." The bill would keep body camera video accessible to only law enforcement and individuals in the video. The bill would also mandate that any state law enforcement agency destroy within 90 days any impertinent data within an active or inactive investigation. The high cost of redacting private data is another reason for keeping video from public records requests, said Cornish, chair of the Minnesota House Public Safety Committee. "Naturally, it's going to be something other than public," Cornish said. "You aren't going to have huge amounts of footage of innocent people, put into storage or a hard drive and allow people to walk in and get it." Cornish, a Republican, has a bipartisan ally in State Sen. Ron Latz, chair of the Senate Judiciary Committee. "I don't think we have much of a choice but to struggle to get our arms around it," Latz said, according to MPR. "Here's a case where technology is out a little bit ahead of public policy." While police organizations support the bill and often advocate as much concealment of body camera video as possible, reformers say that keeping most footage private does not encourage trust in police departments. "Our concern is that if you make it too private, the whole idea that we are able to use the body cameras to watch the police, to turn this around and say this is surveillance of law enforcement, really falls by the wayside," said Ben Feist, legislative director for the American Civil Liberties Union of Minnesota. Feist told MPR his organization is open to keeping some video private in sensitive cases. Minnesota Newspaper Association lobbyist Mark Anfinson, meanwhile, said all footage should be available to the public, even if that means figuring out how to protect identities and other private information. "The more you talk about this and think through the ramifications of what sort of video may actually be acquired, it does get complex," Anfinson said. "But you know what? You can't let complexity paralyze you." The emergence in popularity of police body cameras has suddenly revived the merits of public privacy – often an afterthought for government agencies in the era of big data, warrantless wiretapping, the USA Patriot Act, and National Security Agency snooping – in eyes of law enforcement. “Adoption of body-worn cameras must not lead to a new era of voyeurism and entertainment television at the expense of Missourians' privacy,” Koster wrote in a letter to state Senate President Pro Tem Dempsey. In a 2014 US Department of Justice publication on the implementation of police body cameras -- prepared by the Police Executive Research Forum - similarly encourages privacy protections. “As technology advances and expectations of privacy evolve, it is critical that law enforcement agencies carefully consider how the technology they use affects the public’s privacy rights, especially when courts have not yet provided guidance on these issues,” the report stated. Meanwhile, video footage of the murder of a Flagstaff, Ariz., police officer was recently released, as RT reported, sparking further debate about body cameras and privacy protections.